They said they were protesting fracking exploration on indigenous lands in Canada. 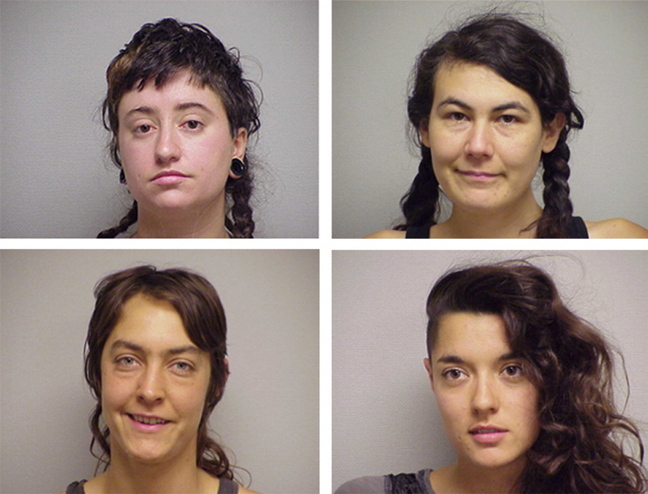 PORTSMOUTH, N.H. — Five protesters, four of them locked to each other with steel pipes, have been arrested after refusing to leave the Irving Oil corporate building in Portsmouth, where police said they threw glitter and blew whistles. They said they were protesting fracking exploration on indigenous lands in Canada. Four are from Maine and one is from Texas. Police said they were among 25 protesters who entered the building. The women locked to each other remained seated in a circle in the lobby. They were carried out and charged. According to seacoast.com, Anne St. Amand, 26, of Portland, was charged with disorderly conduct, criminal trespass and criminal mischief/vandalism. Christine Baglieri, 26, of Belgrade, Sara Moscoso, 26, of Belmont, and Christine Elizabeth Buchanan, 30, of Belgrade, were all charged with disorderly conduct, criminal trespass, criminal mischief/vandalism and resisting arrest.